During the 1920s, Route 66 appeared out of a desire to improve the road network in the West, which featured a hodgepodge of tracks and trails that had been established by American Indians and pioneers. A descendant of the early 1900s “National Old Trails Road,” the new two-lane route would join the Midwest to California. 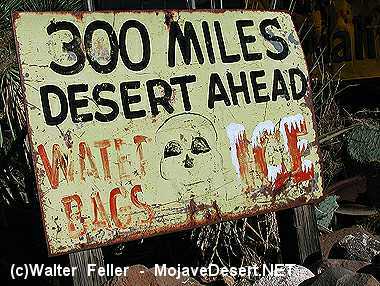 During the Great Depression of the 1930s migrants sought out the Mojave as an area where they might be able to grow their own food without regard for unstable world markets. Sandstorms and drought drove millions from the Dust Bowl toward California on Route 66. During and after World War II Americans traveled the route heavily, though the roadway was narrow and accidents frequent. In 1956 interstate highways, including Routes 40, 15, and 10 through Arizona and California, began to skirt around the towns along Route 66 closely paralleling the older route. By 1985 the last of these, Williams, Arizona, was bypassed. Route 66 was also to become a legend—“the Mother Road” and “the Main Street of America”—immortalized in John Steinbeck’s The Grapes of Wrath, Nat King Cole’s “(Get Your Kicks on) Route 66,” and a popular 1960s television show. It is no longer necessary to drive any part of Route 66 to reach California from Chicago. However, a new generation of travelers has made a hobby of tracing authentic pieces of the highway, following the “Historic Route 66” signs that began appearing in 1995 in all of the route’s eight states. Hoover Dam, which was completed in 1935, created Lake Mead. It took five thousand men, working day and night, five years to complete construction of the dam. 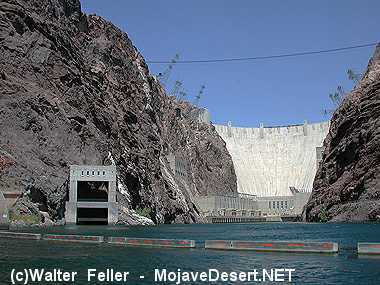 Davis Dam was completed in 1953, downstream from Hoover Dam, and controls the flow of water from Lake Mohave. Today over twenty million people can prosper in the area, thanks to the availability of the real gold — water. The area’s future depends on the wise use of this limited resource.